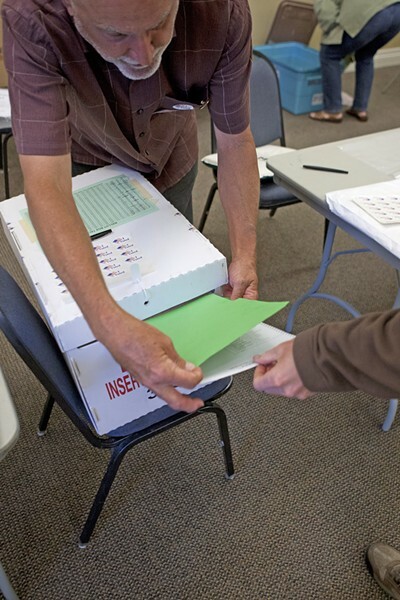 With the 2018 general election a little more than a week away, SLO County Clerk recorder Tommy Gong said voter registration has already exceeded that of the 2016 presidential election. As of Oct. 24, Gong said voter registration in SLO County had topped 170,000 people, surpassing the 168,275 registrations recorded in the 2016 presidential election. GETTING OUT THE VOTE SLO County Clerk Recorder Tommy Gong says voter registration in the county for the Nov. 6 elections has exceeded that of the 2016 presidential elections. "It's a little mind-boggling," Gong told New Times. "You almost never see registration in a gubernatorial election exceed a presidential one. It's tremendous." Gong credited the high numbers to the increasing use of online voter registration and energetic voter registration efforts in the county. That included Cal Poly's participation in The Ballot Bowl, a statewide initiative that challenged California universities and community colleges to compete in a "friendly competition" to see which campus could register the most voters. According to data from the California Secretary of State's Office, Cal Poly SLO surpassed all of the state's other college campuses, registering 2,754 voters as part of the competition. Both parties are pushing to energize voters. Democrats are framing the midterms as a referendum on President Donald Trump. Republicans are attempting to leverage recent political flashpoints such as the appointment of Supreme Court Justice Brett Kavanaugh to help them maintain their majority in the House and Senate. "There does seem like there's an elevated interest in this election," Gong said. "Certainly, it's a more elevated interest compared to past gubernatorial elections." As of Oct. 24, Gong said his office had received more than 21,000 vote-by-mail ballots. He predicted that turnout for the election would be between 73 and 75 percent. That number is higher than the 58 percent turnout in the 2014 gubernatorial election, but lower than the county's 83 percent turnout in the 2016 presidential election. Gong said that his office was finalizing a report on the county's voter registration numbers, which would be released after New Times went to press.